Study this classic PowerPoint example to become an instant expert. One of the coolest PowerPoint slideshows I have ever seen is one of PowerPoint’s own templates; it’s called "Duarte’s Five Rules." It uses animation, graphics, fonts, layout, design, sound, narration, and timing perfectly. The tips below explain and illustrate how many of the effects in this slide were created. 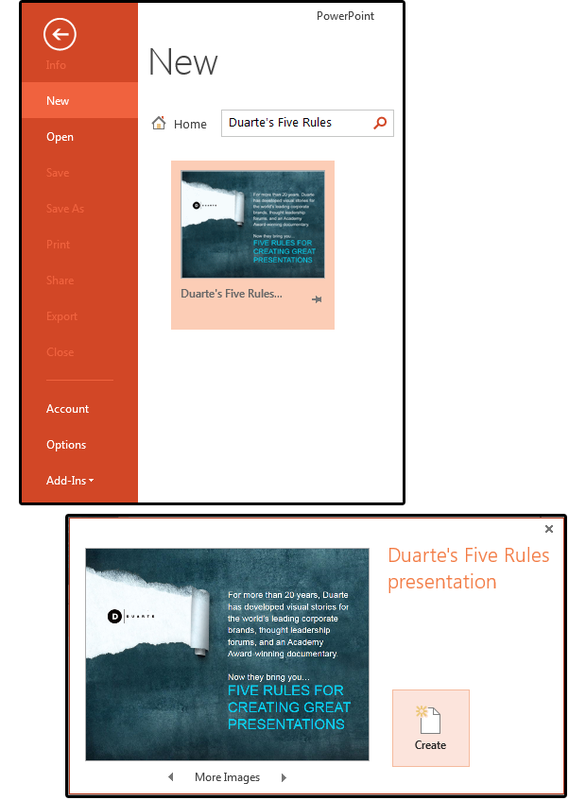 First, open PowerPoint, type Duarte’s Five Rules in the Search box, then press Enter. Click the Duarte icon when it appears, then click the Create button in the popup window. When the presentation appears, select Slideshows > From the Beginning or press F5. Click through the first two slides (the rest is automatic), turn up the sound, then sit back, watch, listen, and learn how to create a very professional presentation. And if you’re wondering “how did they do that,” the tips below will help. If your slideshow is going to run at a kiosk, at a trade show, at a sales presentation, or a training seminar, it must have the capacity to run without human intervention. 1. Go to Slide Show> Set Up Slide Show. 2. Under Show type in the Set Up Show dialog, click the Browsed at a kiosk (full screen) button. Notice the first check box under Show options is grayed-out because, when the slide show runs automatically, this option is always allowed (in order to pause and exit). 3. You can also set up a slide show that allows viewers to advance the slides themselves (inside a window). For this feature, select Browsed by an individual (window). 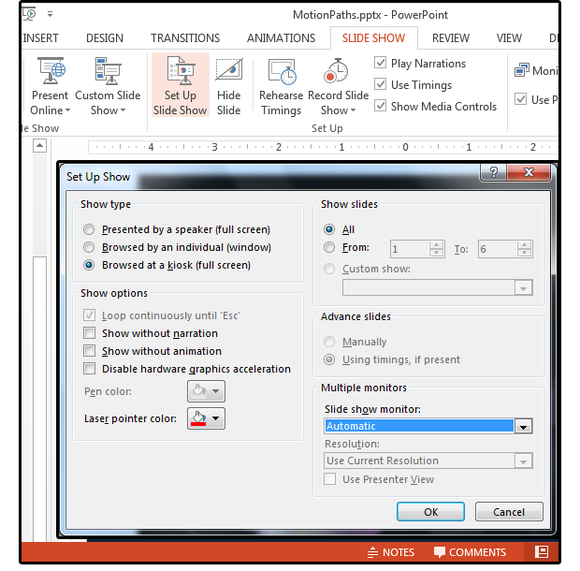 Select the option Presented by a speaker (full screen) if you or one of your colleagues is doing the presentation manually. The rest of the options are self-explanatory and selected based on individual needs. Note: Don’t forget to select slide transitions and match the timing with the narration. 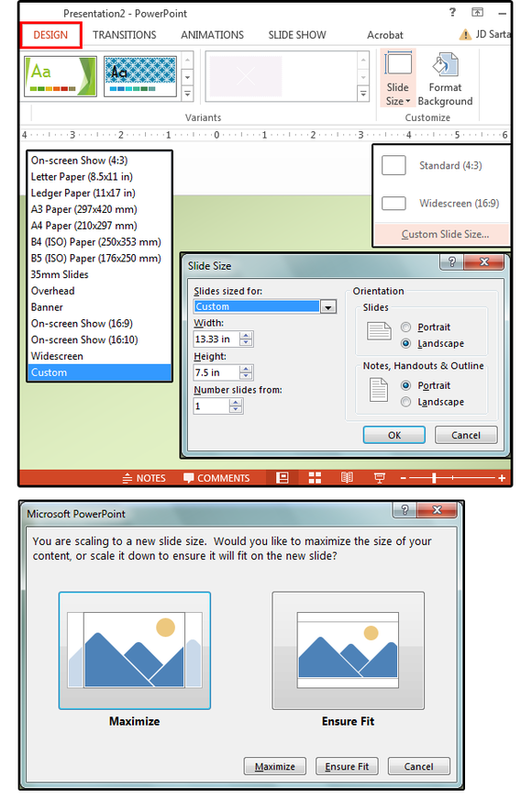 The default size for slides in PowerPoint 2013 and 2016 is now 13.333 inches by 7.5 inches, which is called Widescreen (16:9 aspect ratio). It’s designed to accommodate the more popular widescreen monitors and televisions. Previous versions used the Standard (4:3) aspect ratio to accommodate the older square monitors and televisions. Some have complained about the new default Widescreen size, but—guess what—it’s easy to change. 1. Go to Design > Customize > Slide Size. 2. Choose Custom Slide Size from the dropdown menu. 4. Enter a custom size in the Width and Height field boxes. Note: You can also use the Number slides from field box to specify which slide number will begin using this new size. With this feature, you can vary the slide sizes throughout the presentation. 5. Click OK, and another dialog box opens, prompting you either to Maximize the size of your info and graphics on each slide or resize it to Ensure Fit (that is, ensure the fit onto the new slide size). There is no right or wrong answer here, other than whether your image looks odd when adjusted either way. If you’re presenting the slideshow yourself (or creating it for another), there are several features the presenter can use to add some style and flair to the slide show. For example, when you’re covering an important point, try using the magnifying-glass function to zoom in on the hot points you’re discussing at the moment. 1. While in Presenter View, hover over the bottom left side of the screen until the menu appears. 2. Click the magnifying-glass icon, then move the highlighted window around the screen until you've framed the important points inside the highlighted area. 3. Click the cursor once, and that section expands immediately to a very sharp, zoomed-in close-up of the highlighted points. 4. Once you’re zoomed in, use the hand tool to move around inside the enlarged area. 5. Click the magnifying-glass icon again to zoom back to normal size. 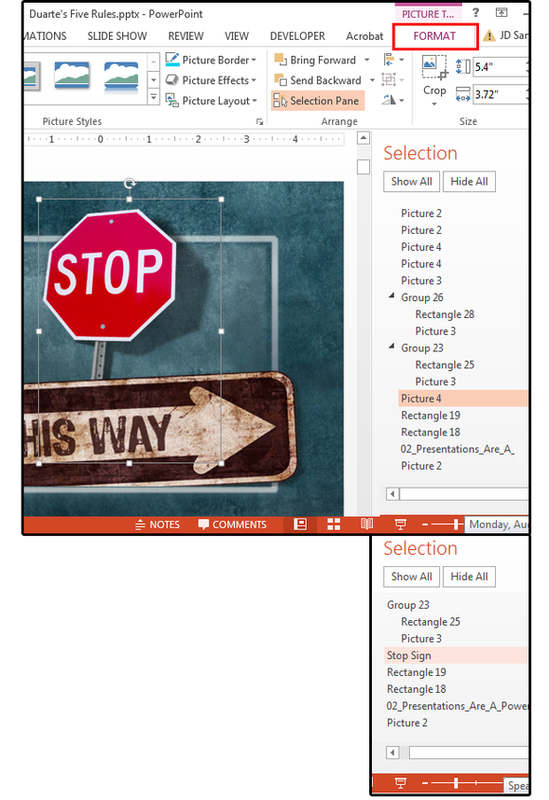 We've already covered how to create Motion Paths, which is one method for making objects move in PowerPoint. The other method is using the preset Effects. 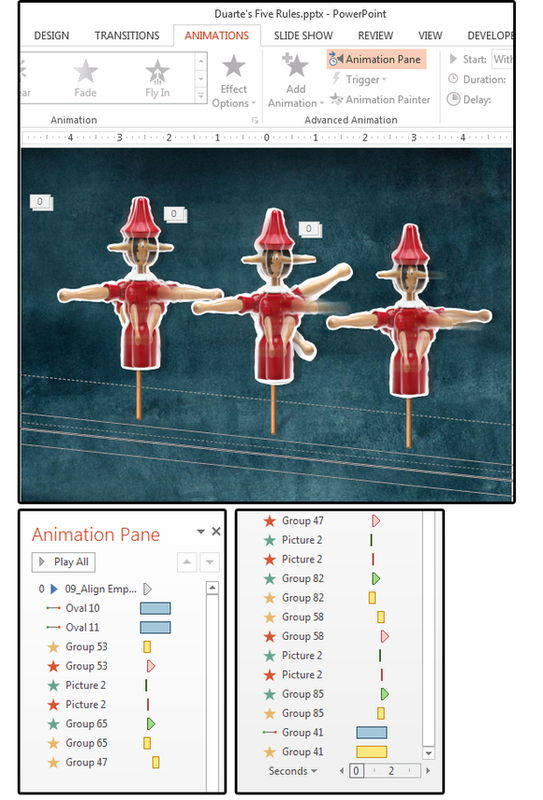 If you want to see how each animation works in a specific slideshow, open the presentation called "Duarte’s Five Rules," and click one of the slides in the Slides Tab panel on the left. 1. Click Slide 3—the slide with the STOP sign and THIS WAY (pointing arrow) sign. 2. Next, select Animations > Animations Pane. Notice the Animations panel that appears on the right side of the screen. All of the animations, effects, and motion paths (when used) are listed on this panel. 3. Note that none of the animations, effects, graphics, or other processes are named in this slide show. Naming the animations makes it easier; however, you can still see which effect is attached to each element by selecting it. 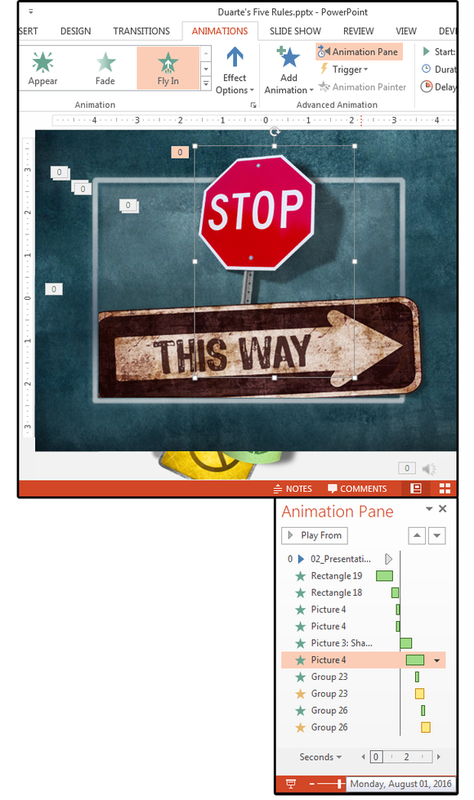 Click the STOP sign; notice the Animation Pane says Picture 4. Also notice the selected button in the Animations Effects menu (at the top) says Fly In. 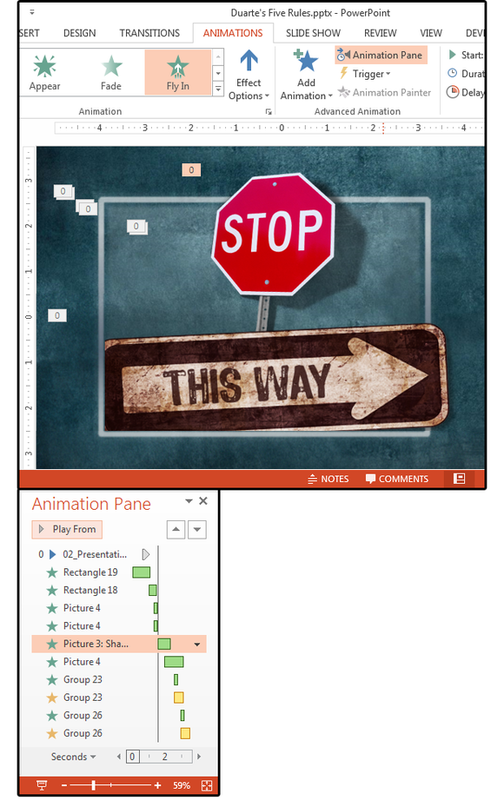 This means the STOP sign will fly into the slideshow screen after the Picture 3 Shape (the sign that says THIS WAY). 4. Position your cursor on the first element in the list: 02_Presentation ... (beside the blue arrow). Click the Play From button, and the animation plays from the beginning of this slide. Move your cursor down the list to the Picture 3 Shape (the sign that says THIS WAY). Click the Play From button again, and the animation plays from that position to the end. This feature is very useful when you’re setting the Timing for each object on the slide. And it saves time, especially if you have a lot of action on a particular slide, because it means you don’t have to rewind to the beginning for every single animation event. Because this slide show has motion paths, animations, or effects on every slide, you can learn more about how these features work by reviewing each slide’s effects individually and playing through all the animations and effects on each slide. Notice how many animation effects are on Slide 6 (the dotted lines are the Motion Paths). Then play through the rest of this slide show and, by the time you reach the end (Slide 56), you will be a professional PowerPoint Animator. Rename your Animation Effects so it’s easier to remember which effect is attached to which object. 1. Click the object (such as the STOP sign) to select it. 2. When you click an object, the Format tab appears (far right). 3. Click the Selection Pane button. 4. When the Selection panel opens, the selected object is highlighted in pink. 5. Double-click the effect (e.g., Picture 4) and then type in a new name.